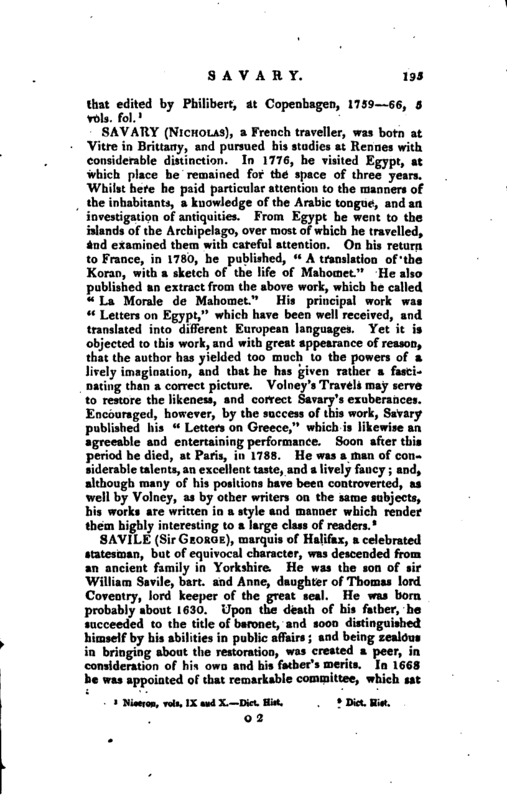 , marquis of Halifax, a celebrated statesman, but of equivocal character, was descended from an ancient family in Yorkshire. He was the son of sir William Savile, bart. and Anne, daughter of Thomas lord Coventry, lord keeper of the great seal. He was born, probably about 1630. 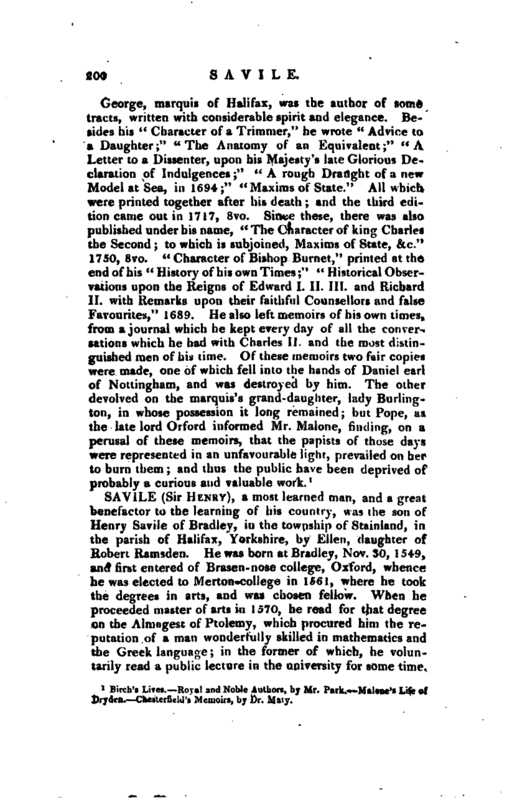 Upon the death of his father, he succeeded to the title of baronet, and soon distinguished himself by his abilities in public affairs; and being zealous in bringing about the restoration, was created a peer, in consideration of his own and his father’s merits. In 1668 he was appointed of that remarkable committee, which sat | at Brook-hall for the examination of the accounts of the money which had been given during the Dutch war, of which no member of the House of Commons was admitted. In April 1672 he was called to a seat in the privy council; and, June following, went over to Holland with the duke of Buckingham and the earl of Arlington, as ambassador extraordinary and plenipotentiary, to treat about a peace with France, when he met with great opposition from hi* colleagues. In 1675 he opposed with vigour the non-resisting testbill; and was removed from the council-board the year following by the interest of the earl of Dauby, the treasurer. He had provoked this lord by one of those witticisms in which he dealt so largely. In the examination before the council concerning the revenue of Ireland, lord Widrington confessed that he had made an offer of a considerable sum to the lord treasurer, and that his lordship had rejected it very mildly, and in such a mariner as not to discourage a second attempt. 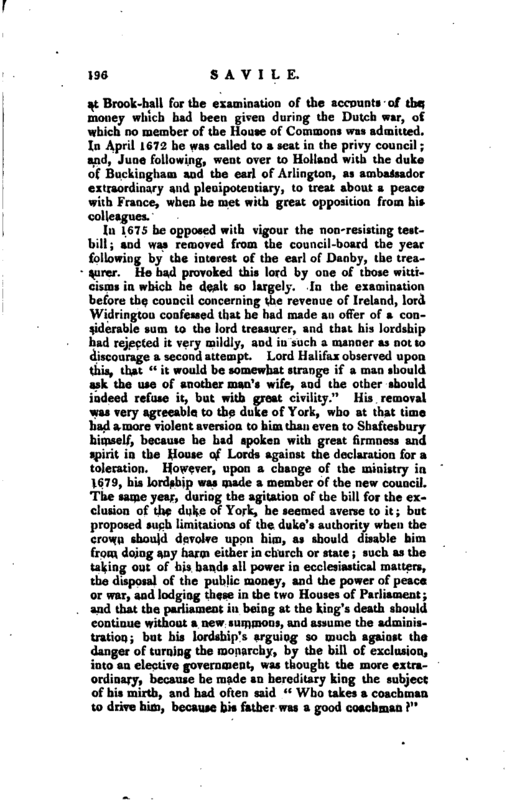 Lord Halifax observed upon this, that “it would be somewhat strange if a man should ask the use of another man’s wife, and the other should indeed refuse it, but with great civility.” His removal was very agreeable to the duke of York, who at that time had a more violent aversion to him than even to Shaftesbury himself, because he had spoken with great firmness and spirit in the House of Lords against the declaration for a toleration. However, upon a change of the ministry in 1679, his lordship was made a member of the new council. 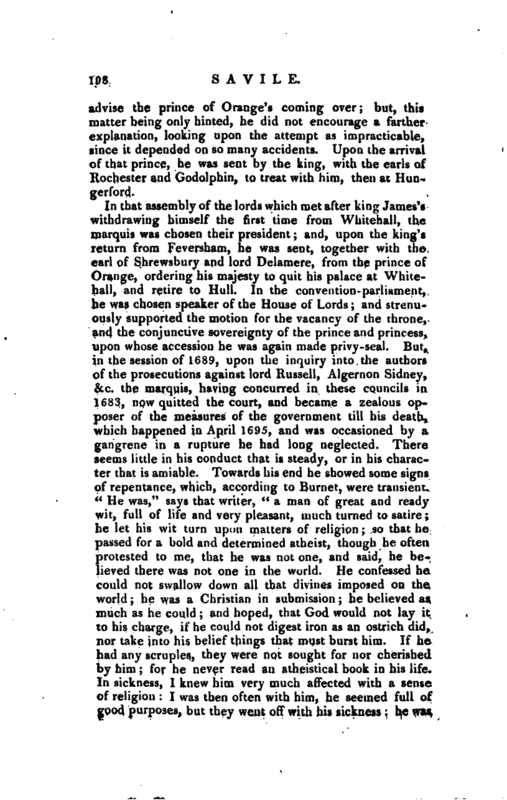 The same year, during the agitation of the bill for the exclusion of the duke of York, he seemed averse to it; but proposed such limitations of the duke’s authority when the crown should devolve upon him, as should disable him from doing any harm either in church or state; such as the taking out of his hands all power in ecclesiastical matters^ the disposal of the public money, and the power of peace or war, and lodging these in the two Houses of Parliament; and that the parliament in being at the king’s death should continue without a new summons, and assume the administration; but his lordship’s arguing so much against the danger of turning the monarchy, by the bill of exclusion, into an elective government, was thought the more extraordinary, because he made an hereditary king the subject of his mirth, and had often said “Who takes a coachman to drive him, because his father was a good coachman” | Yet he was now jealous of a small slip in the succession; though he at the same time studied to infuse into some persons a zeal for a commonwealth; and to these he pretended, that he preferred limitations to an exclusion, because the one kept up the monarchy still, only passing over one person; whereas the other really introduced a commonwealth, as soon as there was a popish king on the throne. And it was said by some of his friends, that the limitations proposed were so advantageous to public liberty, that a man might be tempted to wish for a popish king, in order to obtain them. 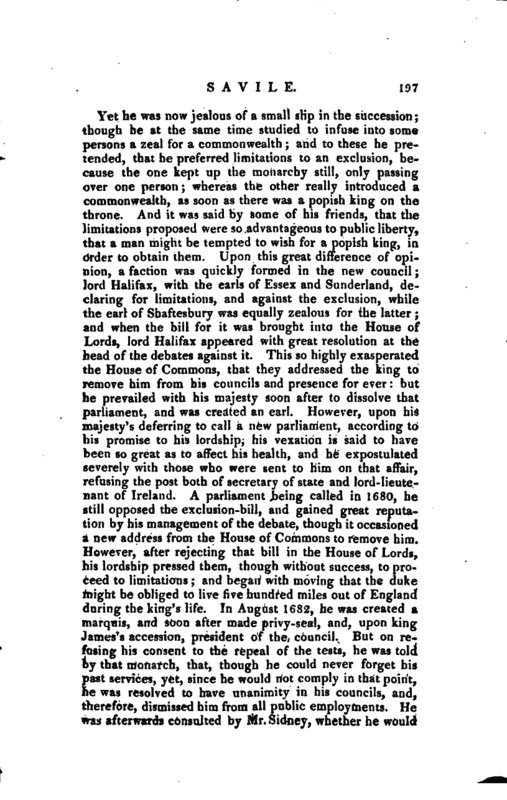 Upon this great difference of opinion, a faction was quickly formed in the new council; lord Halifax, with the earls of Essex and Sunderland, declaring for limitations, and against the exclusion, while the earl of Shaftesbury was equally zealous for the latter; and when the bill for it was brought into the House of Lords, lord Halifax appeared with great resolution at the head of the debates against it. This so highly exasperated the House of Commons, that they addressed the king to remove him from his councils and presence for ever: but he prevailed with his majesty soon after to dissolve that parliament, and was created an earl. However, upon his majesty’s deferring to call a new parliament, according to his promise to his lordship, his vexation is said to have been so great as to affect his health, and he expostulated severely with those who were sent to him on that affair, refusing the post both of secretary of state and lord-lieutenant of Ireland. A parliament being called in 1680, he still opposed the exclusion-bill, and gained great reputation by his management of the debate, though it occasioned a new address from the House of Commons to remove him. However, after rejecting that bill in the House of Lords, his lordship pressed them, though without*success, to proceed to limitations; and began with moving that the duke might be obliged to live five hundred miles out of England during the king’s life. In August 1682, he was created a marquis, and soon after made privy-seal, and, upon king James’s accession, president of the council. 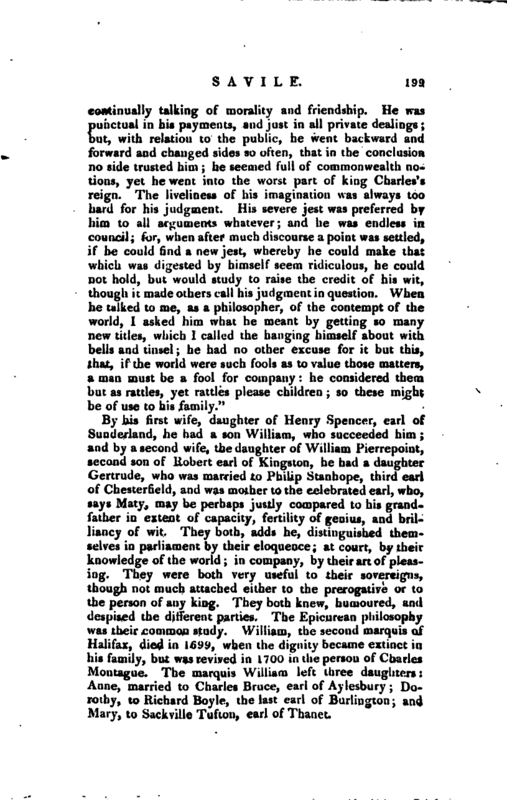 But on refusing his consent to the repeal of the tests, he was told by that monarch, that, though he could never forget his past services, yet, since he would not comply in that point, he was resolved to have unanimity in his councils, and, therefore, dismissed him from all public employments. He was afterwards consulted by Mr. Sidney, whether he would | advise the prince of Orange’s coming over; but, this matter being only hinted, he did not encourage a farther explanation, looking upon the attempt as impracticable, since it depended on so many accidents. Upon the arrival of that prince, he was sent by the king, with the earls of Kochester and Godolphin, to treat with him, then at Hungerford. Birch’s Lives. Royal and Noble Authors, by Mr. Park. Malone’s Life of Dryden. Chesterfield’s Memoirs, by Dr. Maty.